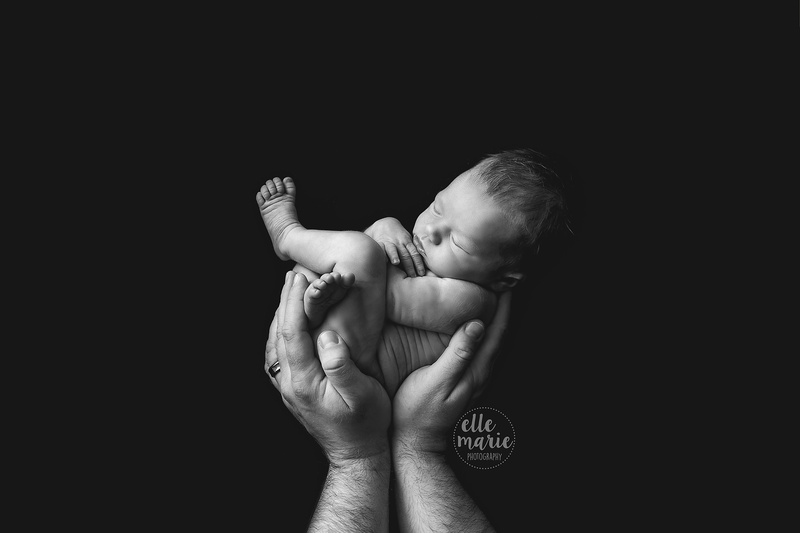 Chris and Julia contacted me several weeks before their due date, they wanted to meet and chat about the possibility of booking a session together. I LOVE when this happens! 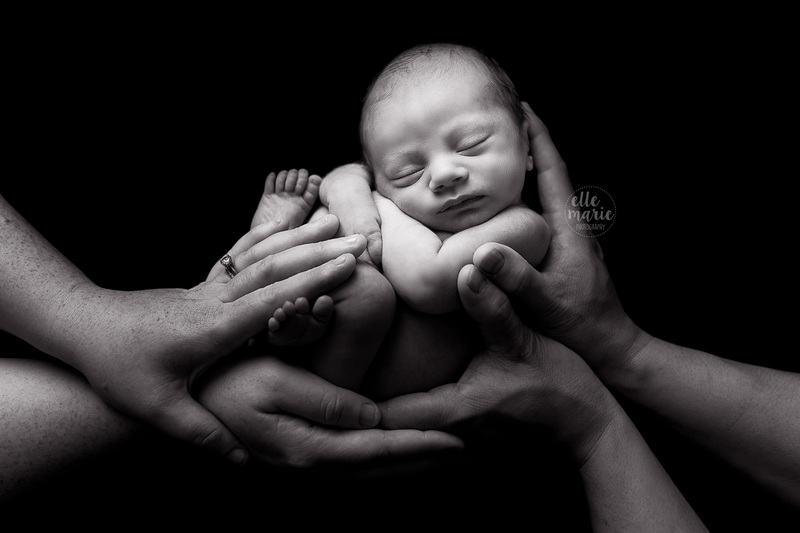 I love meeting new parents-to-be and having them into my studio so we can chat. 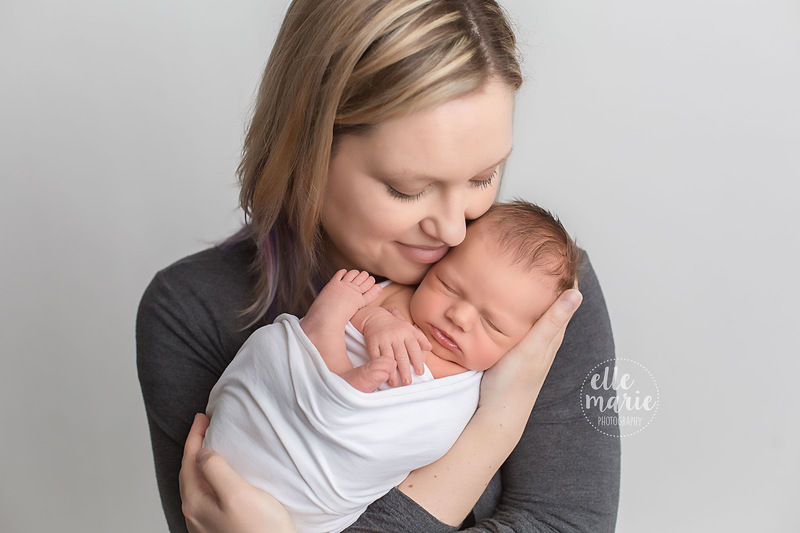 We can get to know each other a little, talk about newborn safety, I can explain what to expect during a newborn session, give a little tour of the studio, and show you all of the beautiful options for finished pieces of your own gorgeous images of your new little one. 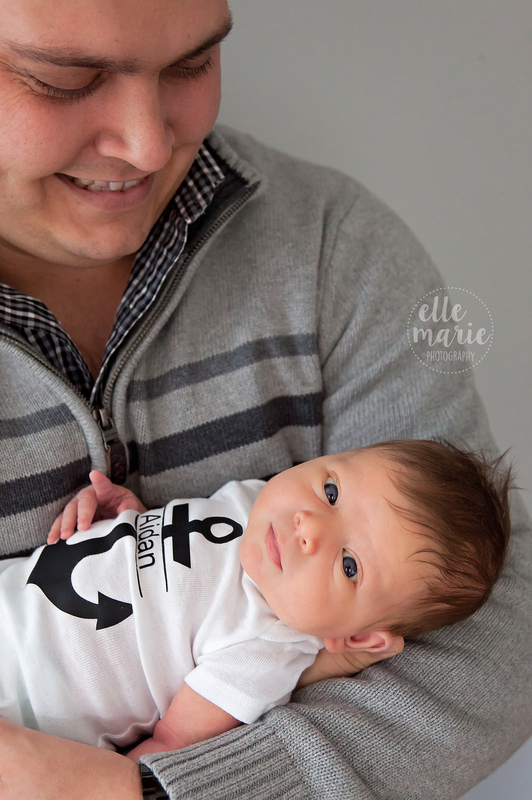 Fast forward to mid May, and baby Hannah made her appearance! 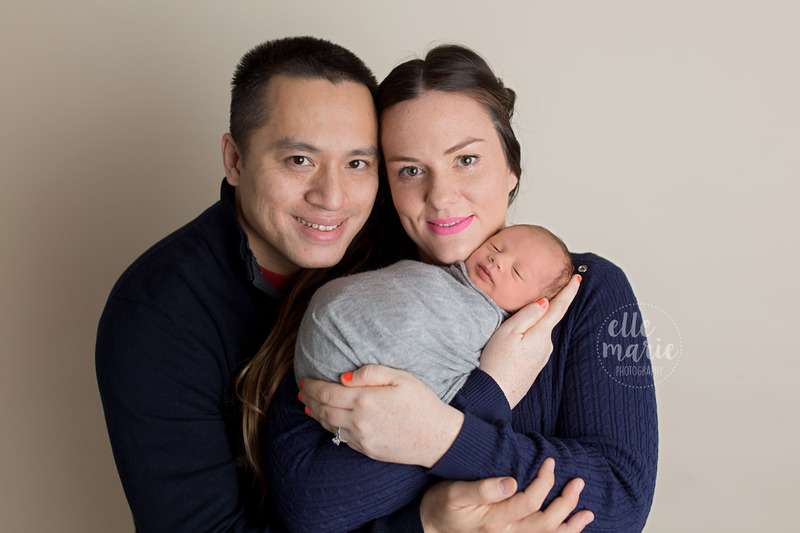 Just after a week later, Chris and Julia brought little Hannah into the studio for her photos. 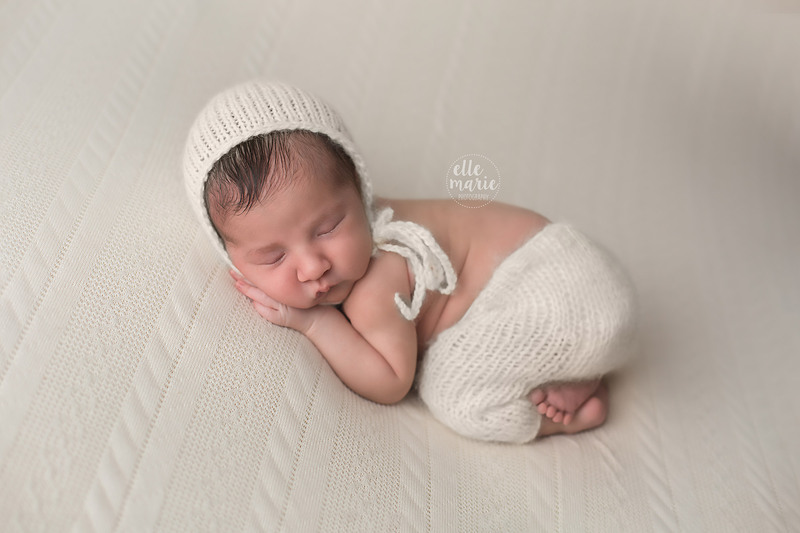 She was a dream to work with, she slept the entire time and made my job easy! 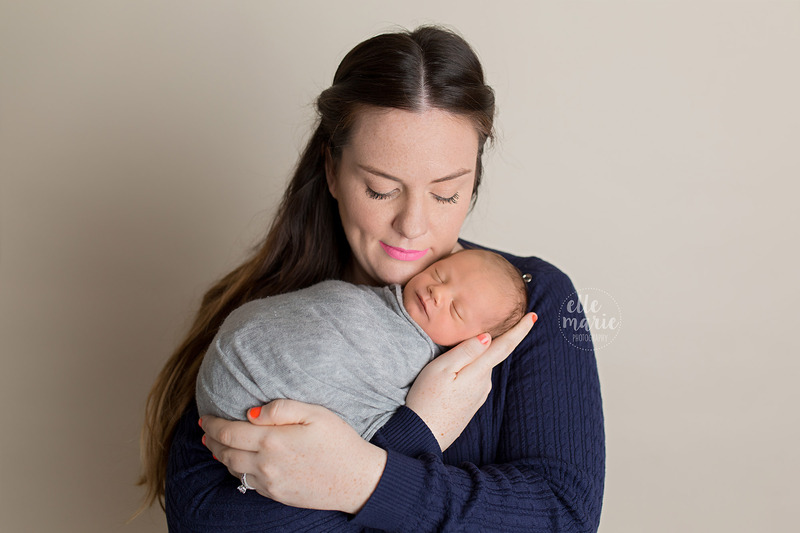 Here are just a few of my favourites from Hannah’s session with me, and I can’t wait for her album and circle float mount wall hanging to arrive! 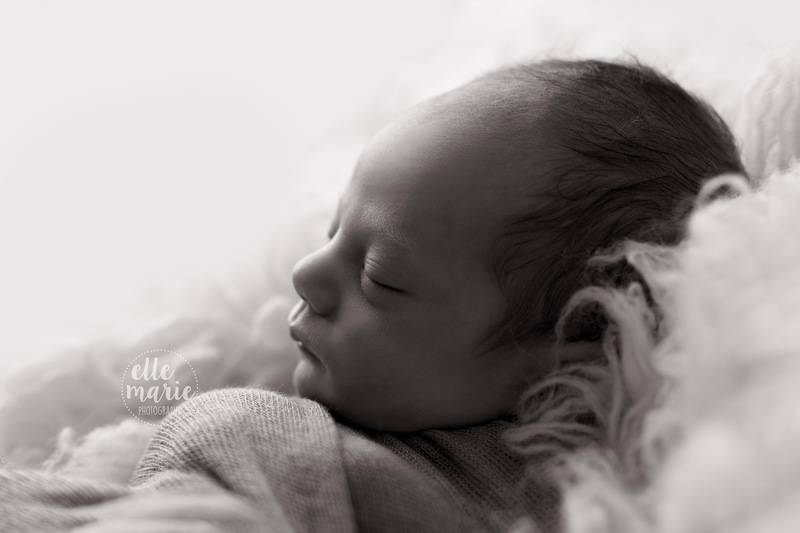 Stephanie and Patrick contacted me about newborn photos months before their due date, they were exploring photography options and I was very happy to chat with them! 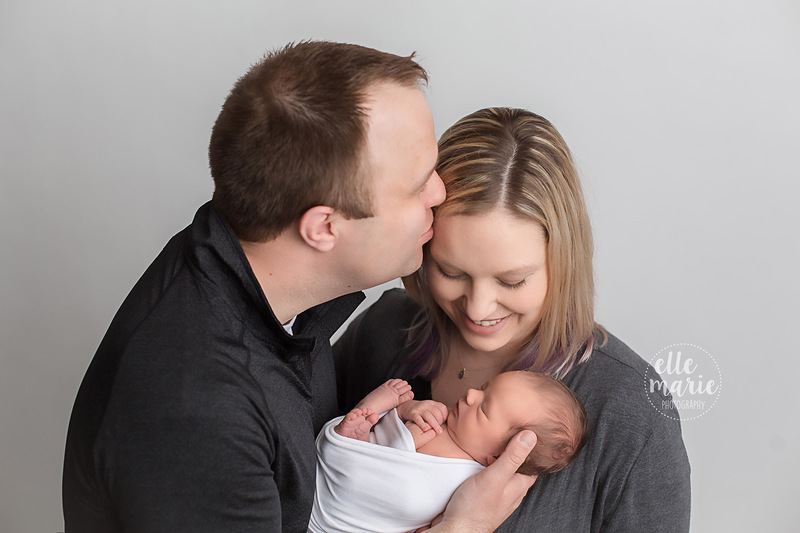 As Stephanie mentioned, this was their first baby and they wanted to do it all for her! 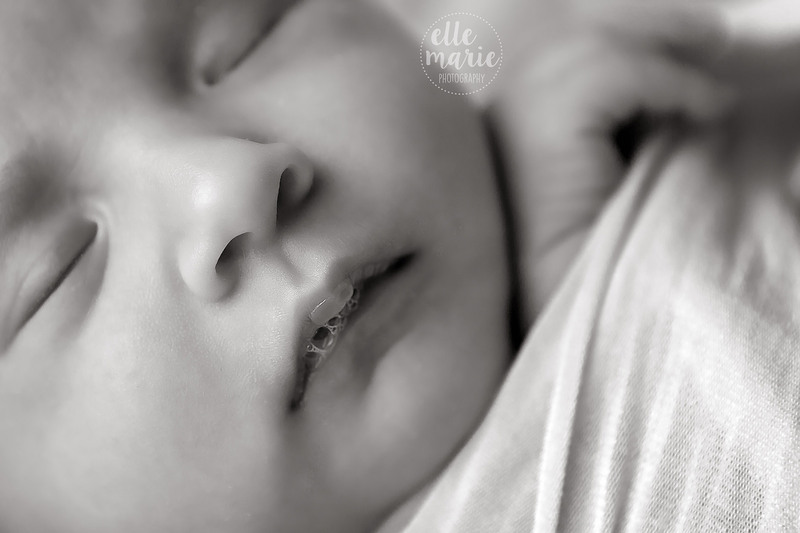 I can definitely relate to that excitement, and completely agree with wanting to capture all of the detail and special moments in quality heirloom pieces that will last a lifetime and more. 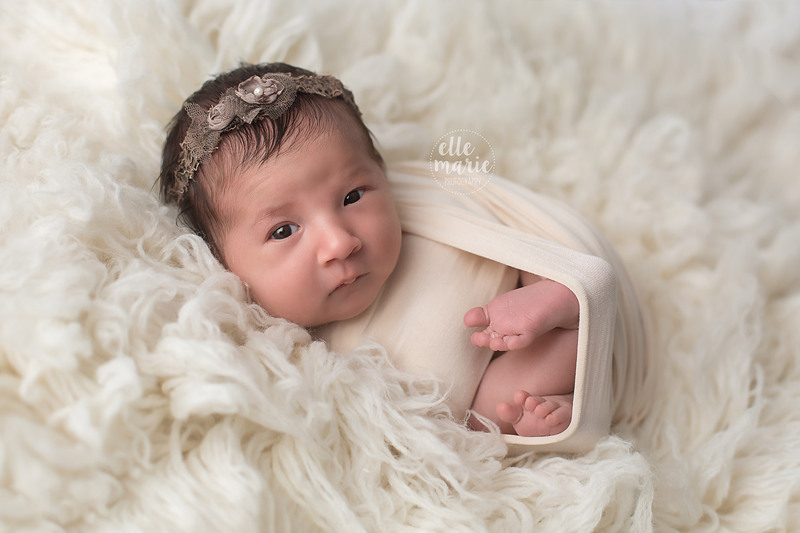 Baby Josephine came into this world in late March and we had her into my Whitby studio at 9 days old. 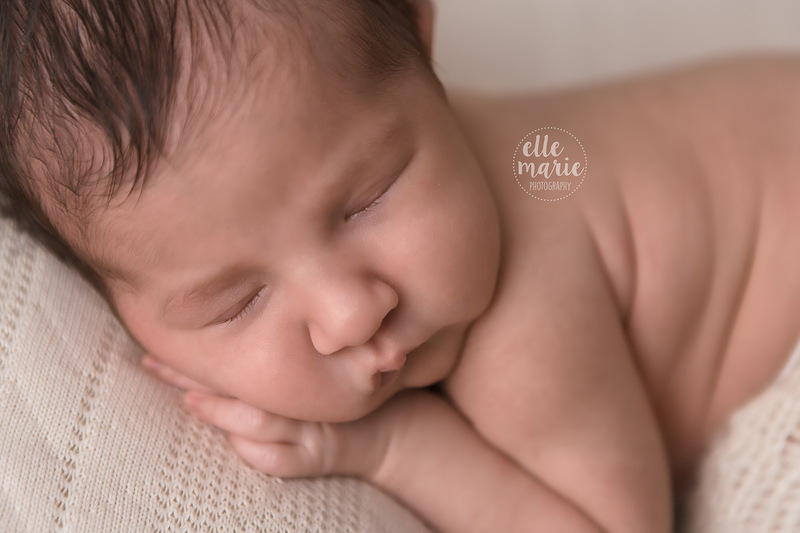 She was equally happy awake and asleep, and gave us some great shots of both! 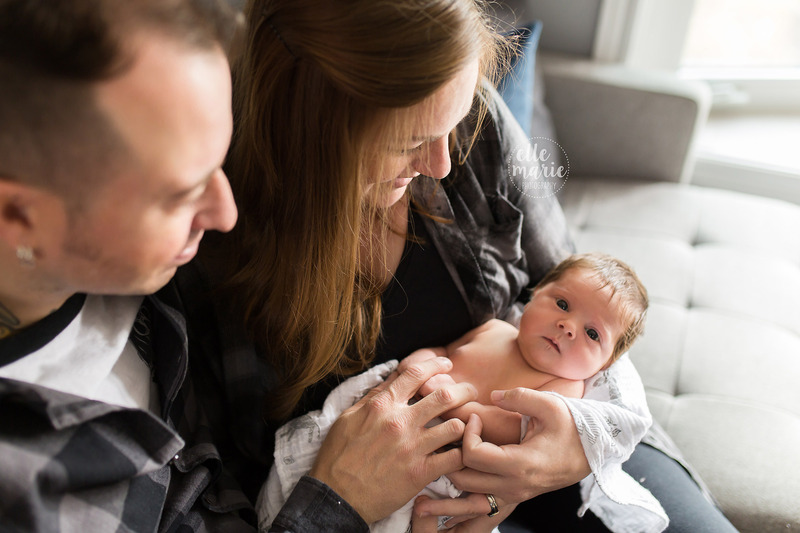 Mom and dad selected a beautiful 8×8″ album of their photos to take home, which I am sure they will look back at fondly many many times over the years, and one day Josephine will be able to share this special piece with her own family as well. 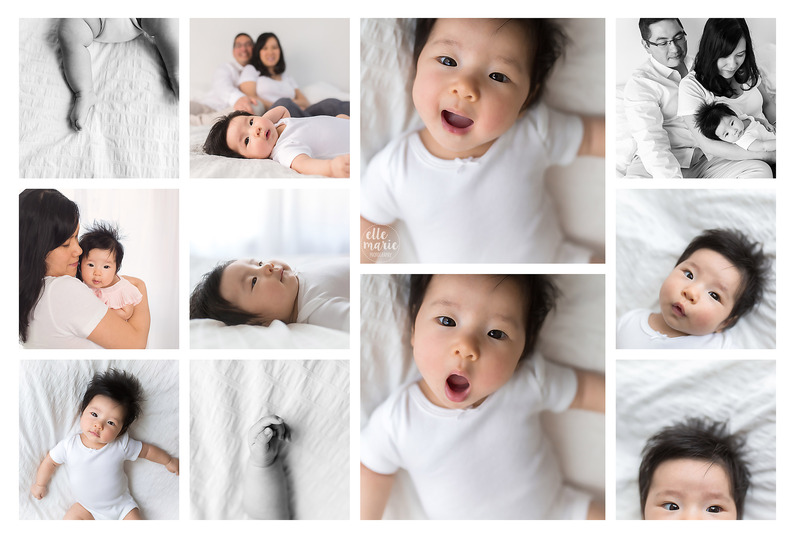 Here are just a few of my personal favourite photos from their session! 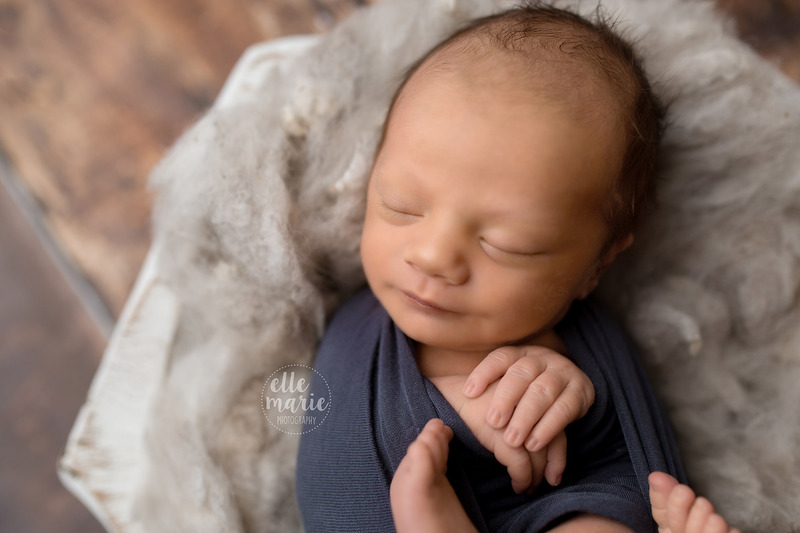 When choosing a newborn photographer to capture your baby in those first few days, above almost all else, it’s important to choose a photographer who’s work you love. 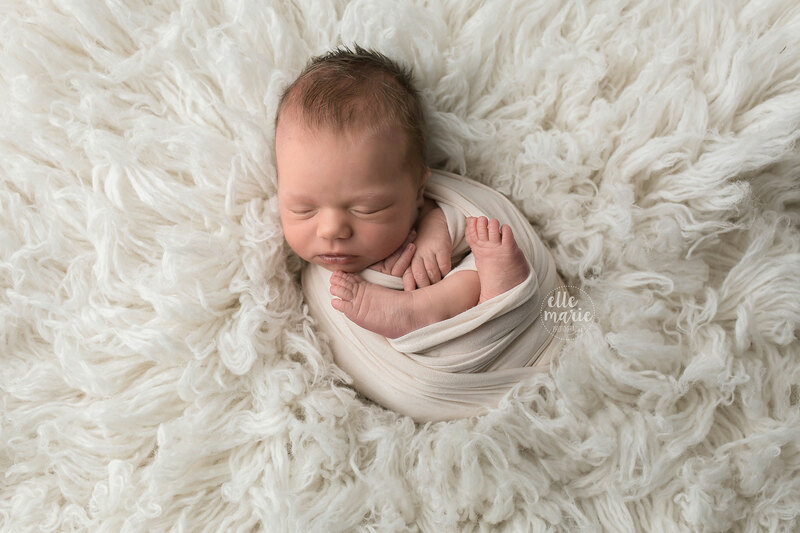 These are the photos you will cherish for a lifetime and will be passed on through generations, and they represent not only the baby in them, but a very special time in the parents’ lives. 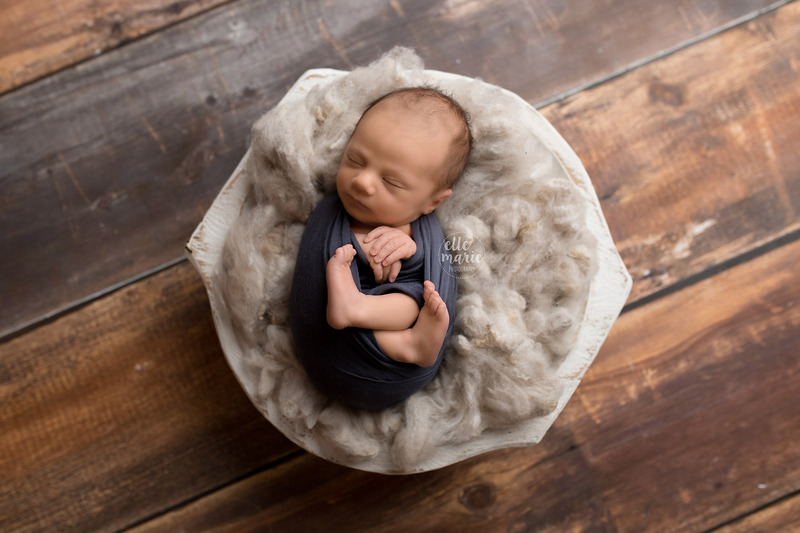 Not only do you want to choose the right photographer to capture these moments, you also want to choose the right type of session to give the look that you are hoping for in your finished photos. 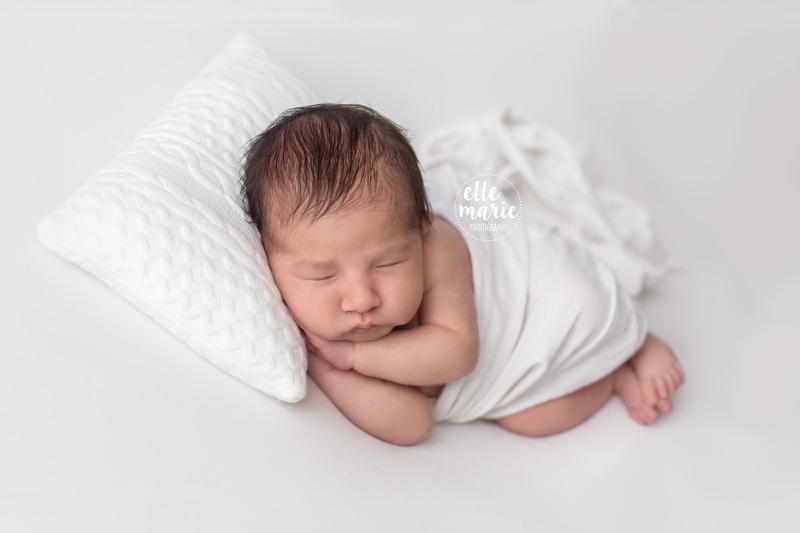 Elle Marie Photography offers both in studio posed sessions, and in home lifestyle sessions, so how do you choose? What is the difference? 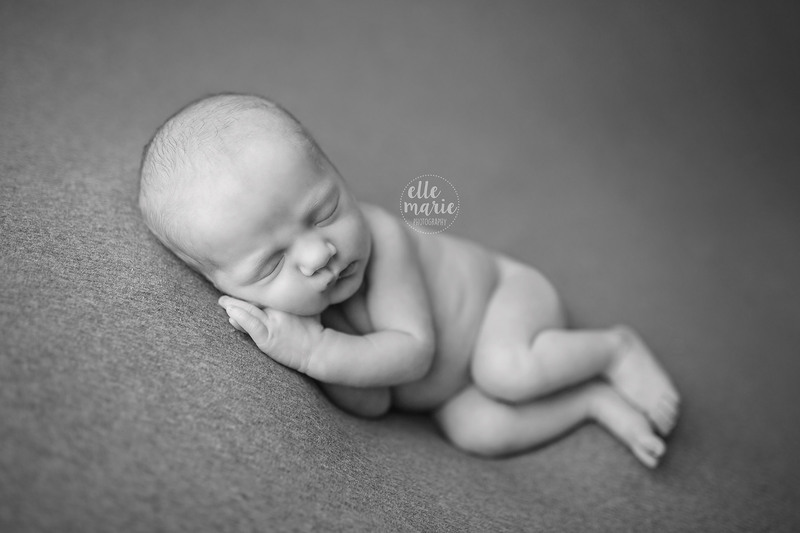 It sure sounds good to have your photographer come to you doesn’t it? But what does that mean for your photos? 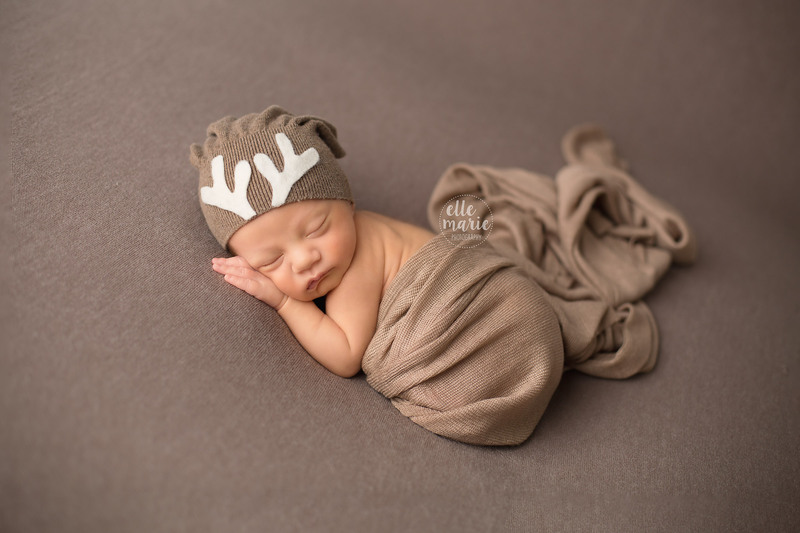 I get asked these questions all the time, so I wanted to write a blog post laying out the differences and help you choose the type of session that works for you. 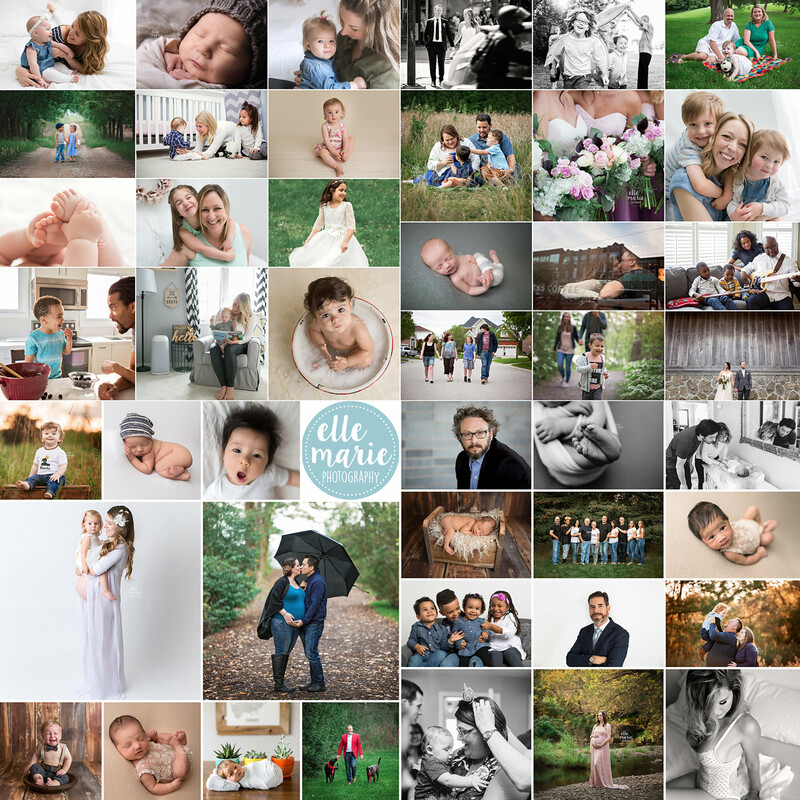 Both kinds of sessions are beautiful, meaningful, and special, but I want to explain a little more about each type of session, and while I can’t speak for all photographers, this blog will outline the differences with me as your photographer! My studio is located in Whitby, Ontario. 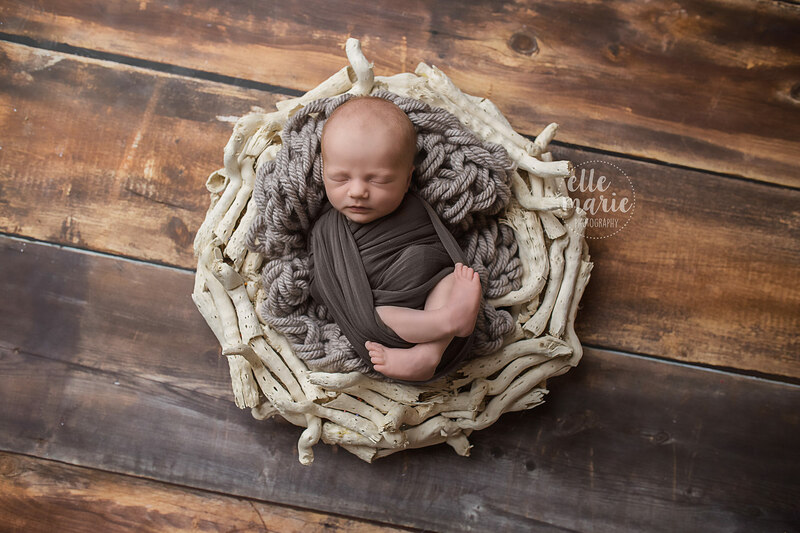 It is where I photograph newborns with their family, it houses my props and it’s also where I do all of my reveal and ordering appointments, although those spill into the rest of my home! 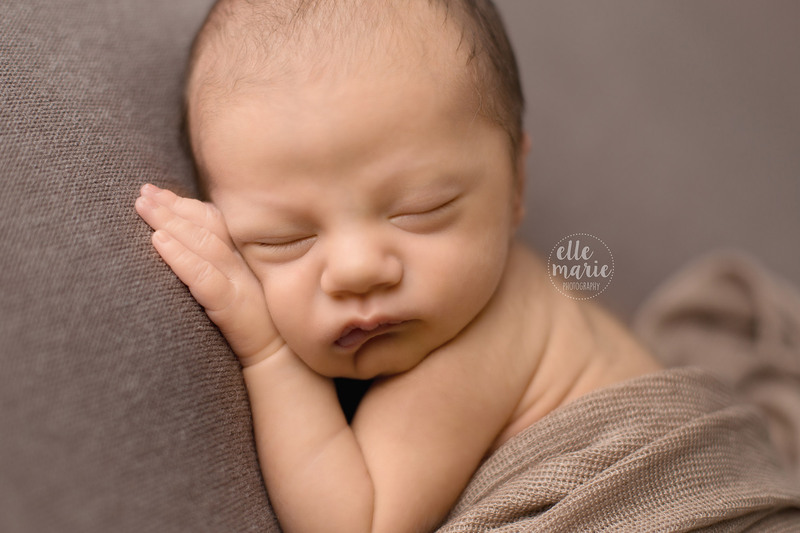 A newborn studio session with me typically lasts about 2-3 hours, depending on baby’s needs on that particular day. 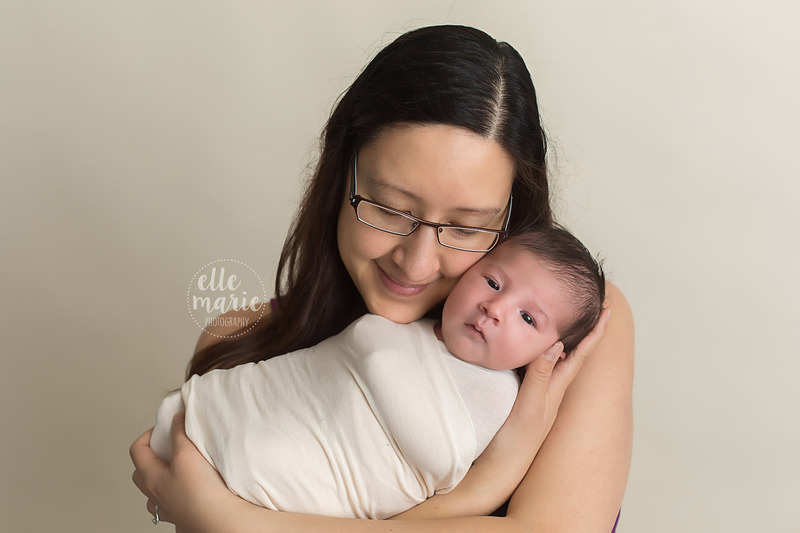 We take the time that is needed, and break often for feeding, snuggles and soothing as often and as frequently as needed. 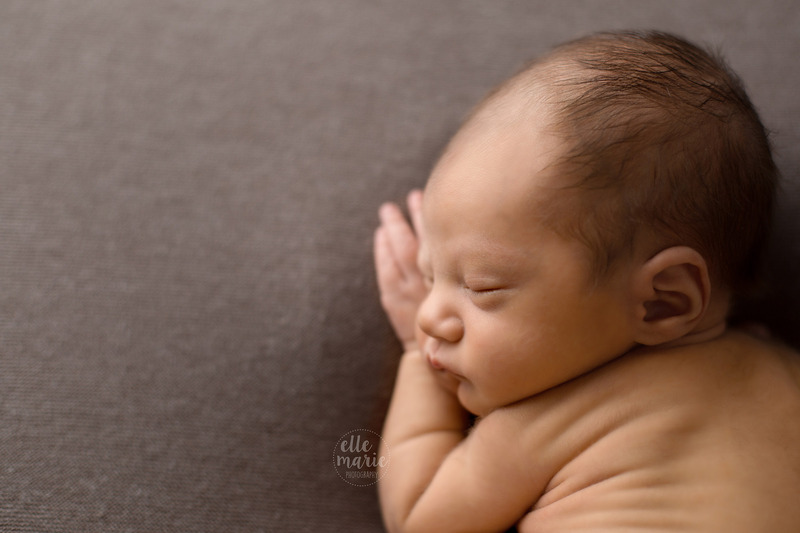 I take a low stress approach, and we follow baby’s cues. 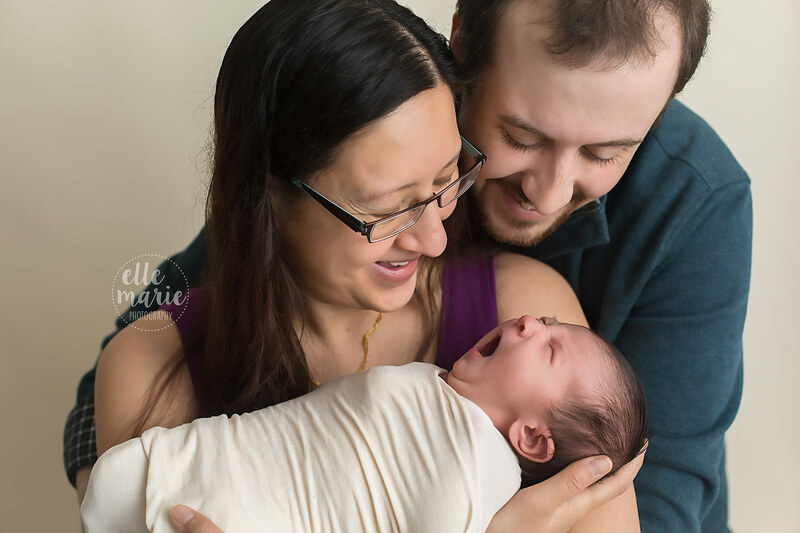 We typically work through 3-5 setups, again depending on what baby allows. 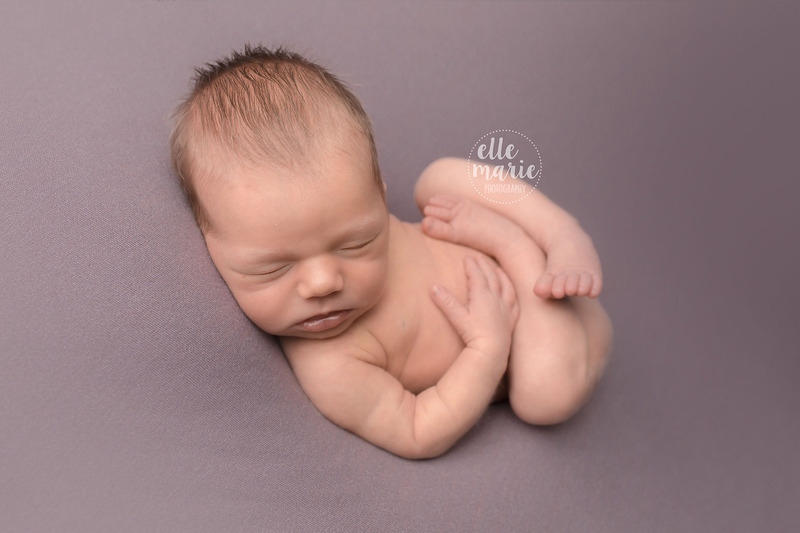 It’s important to remember that not all baby’s will do all poses, and baby’s safety and comfort is most important to me. 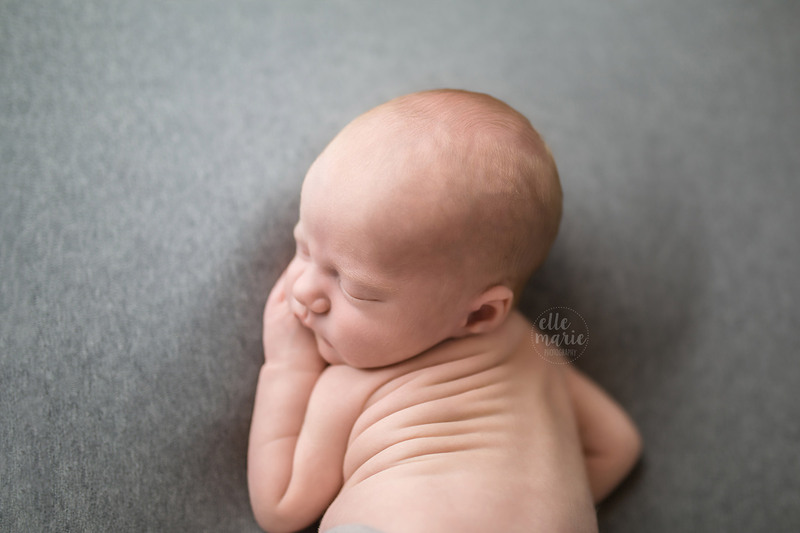 Some babies will achieve more “natural posing” while other babies will curl up any which way I want them to. Studio sessions allow me to have total control over the environment, lighting, and give us the full use of all of my props. 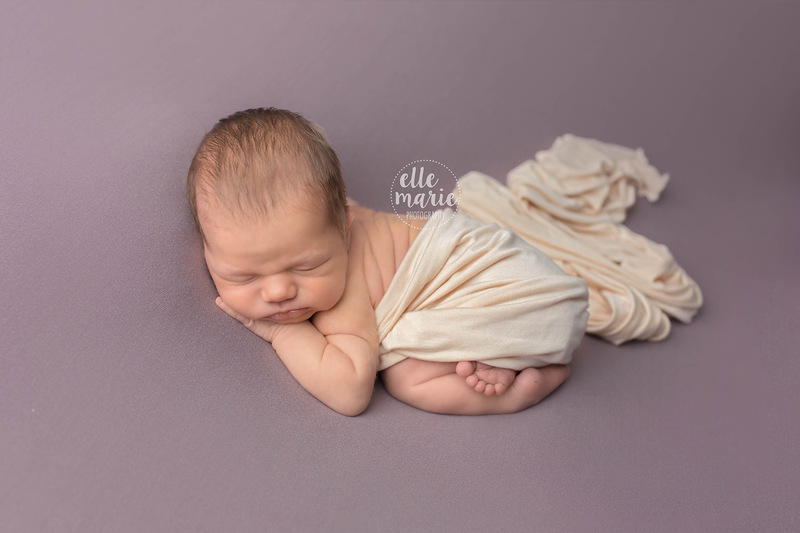 I am not a newborn photographer who uses a lot of props in my completed images, as I feel timeless, emotional images that feature baby in their natural state, produce the best kind of art! 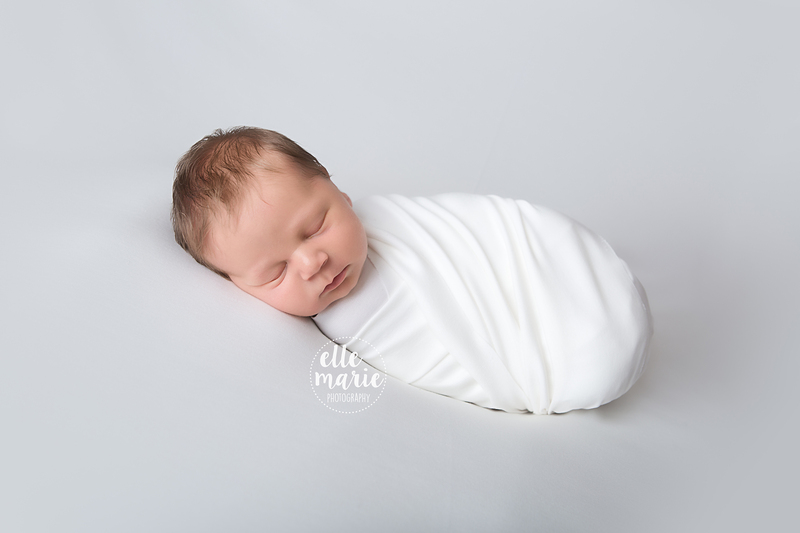 I do however, have a good selection of wraps, backdrops, posing blankets, bowls, crates, outfits, headbands and more, to add that little something to enhance your baby’s photos! 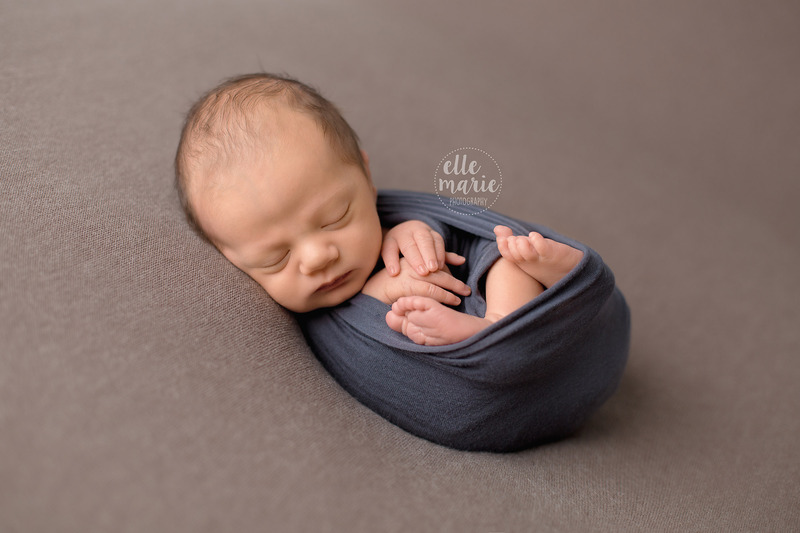 In the end, we will have achieved typically 20-30 photos of your baby, usually including family and any siblings, in those cute, posed positions. 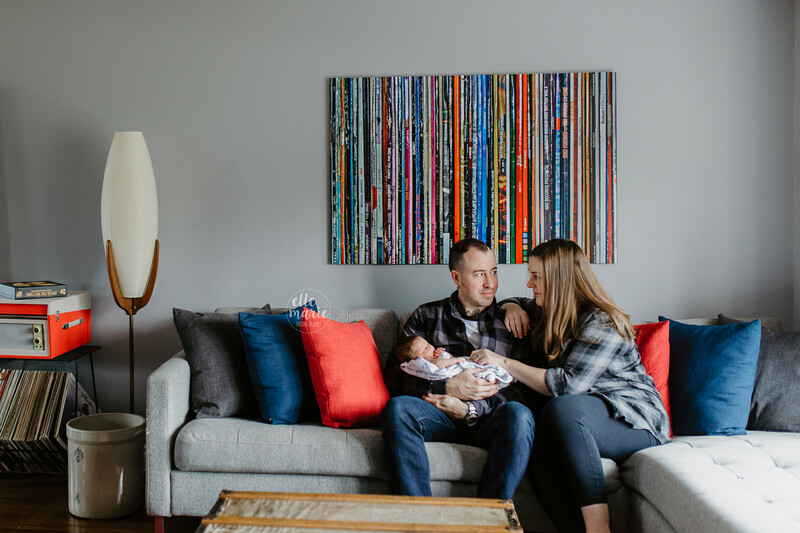 The finished product is a true piece of art, featuring your baby. 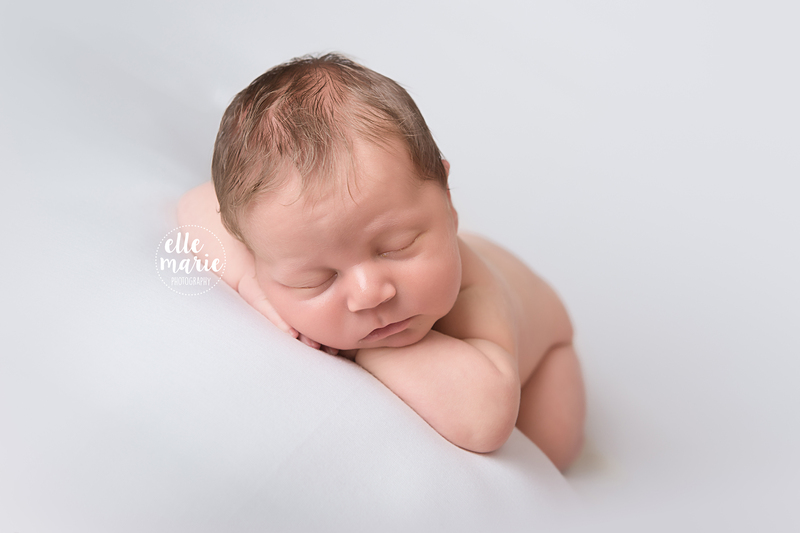 Mom and dad typically get to sit back and relax for most of the session while I do all the work. The lighting is guaranteed. No worries about the small window in the nursery. 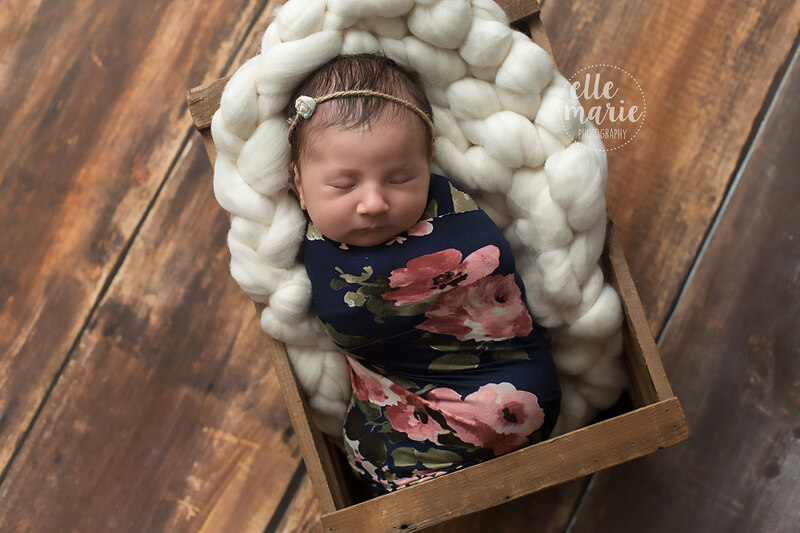 We have access to all of my cute little outfits, gorgeous rugs, and clean and simple backdrops and wraps. A lot of times mom’s worry about the mess, I assure you, don’t worry too much about it! We can move things as needed. 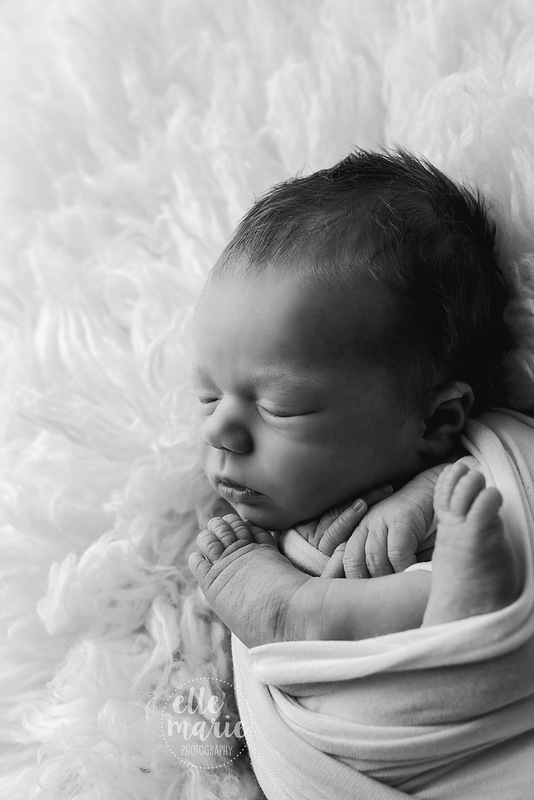 You have a new baby, don’t stress about the mess! 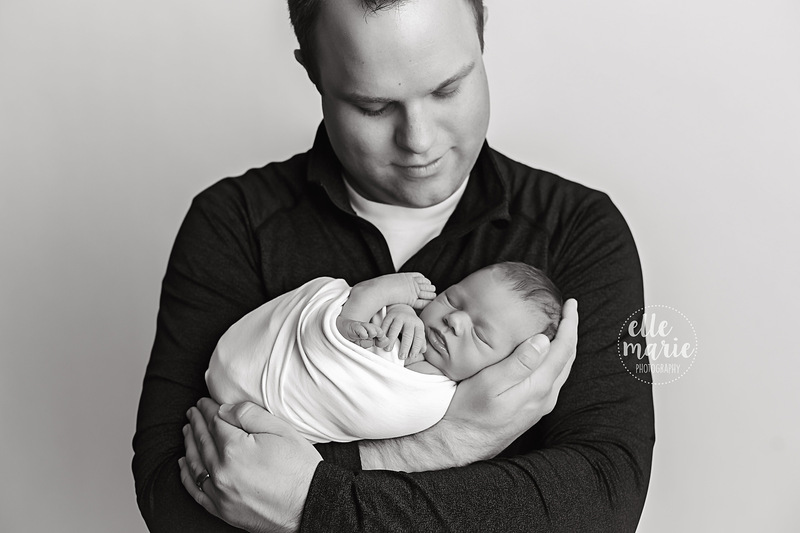 In the end, we typically end up with about 30-35 images from your session for you to choose from. Lifestyle sessions make for a great finished album! 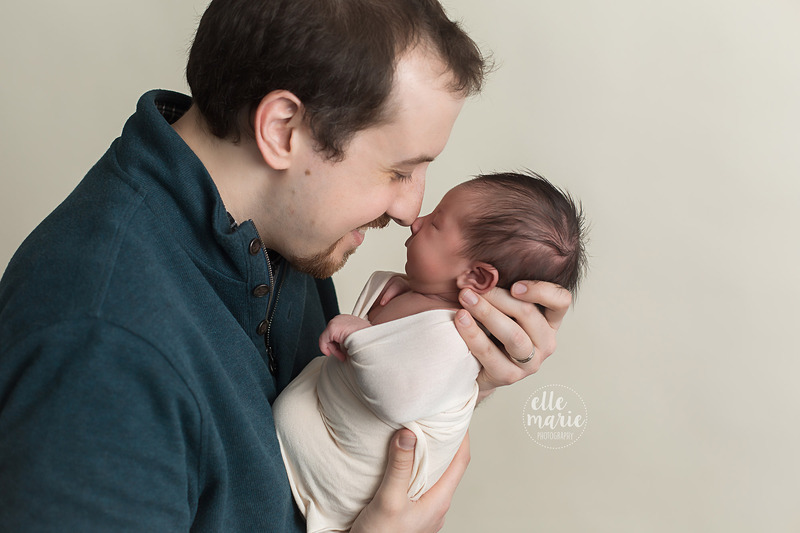 We tend to capture more of those real moments showing the true connection between parent and baby. We are in a place that is very, very special to you. It’s true, you don’t even have to pack up and leave your house! Siblings and/or pets are most comfortable in their own home. 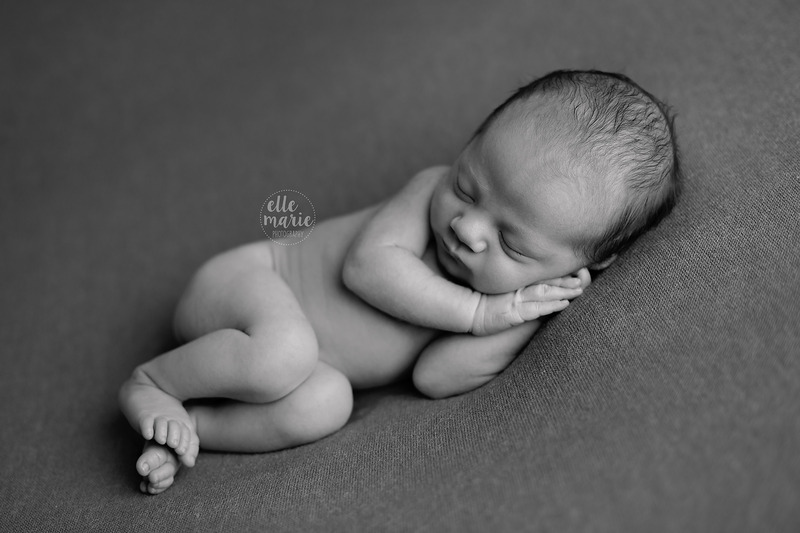 We dont worry as much about getting baby to sleep, so things tend to move along more quickly. My advice to you is to think about the end photos. 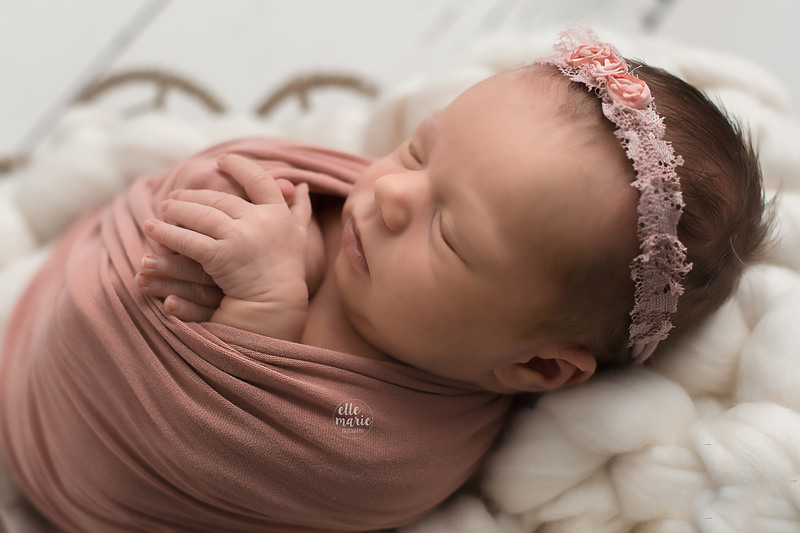 Do you want the natural, in the moment newborn photos around your home, or do you want the cute, curled up newborn poses with the beautiful wraps and cute little head bands? 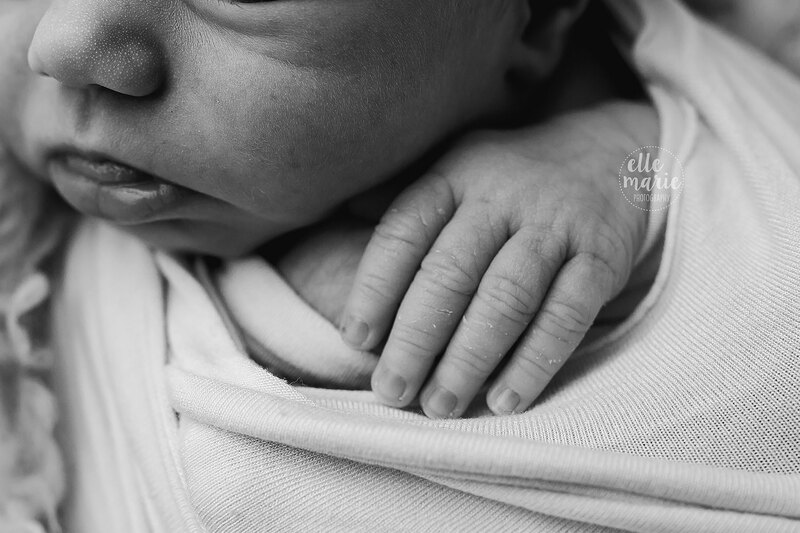 It’s easy to think, ‘oh it would be so much easier to just have Lyndsey come to the house’, and that may be true, but these are your once in a lifetime photos of your new baby. Make the choice you are going to love for a lifetime! I want these photos hanging on your walls, printed in an album, and passed down through generations, make the choice that speaks to you! I’m always happy to talk this through with you. You can send me pictures of your home and we can talk through what might work best for you and your family! Robert is an old friend of mine, we worked together for a few years nearly a decade ago (OMG), we became fast friends, spending lots of lunch hours together, snowboarding, climbing the CN tower, we sailed on a boat, truly one of the best friends I’ve made through work. While we don;t see each other as much anymore, some friends you just will always consider a friend. 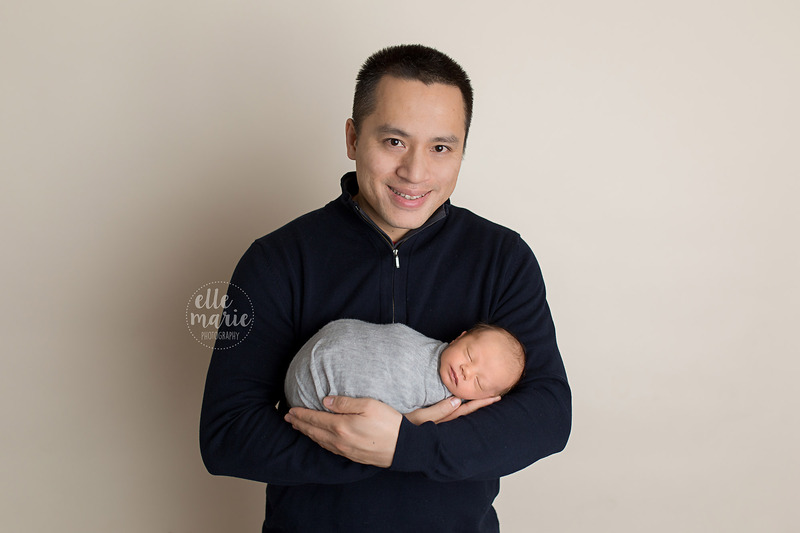 So, I was thrilled when Robert emailed me just over a month ago to let me know him and his wife, Barbara, who is one of the sweetest women I’ve ever met, would be visiting Ontario, from their new home in BC, with their new baby girl, Olivia, and wanted to stop by for some photos! 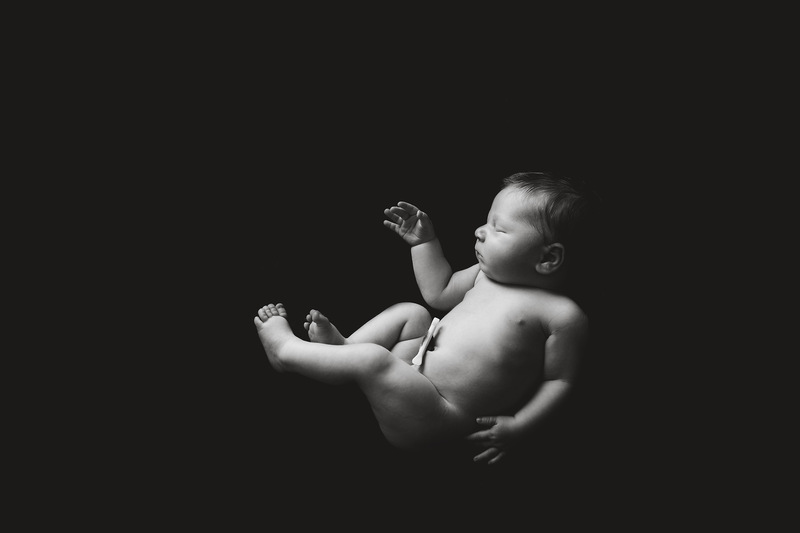 They came into my Whitby studio one morning, and we did a series of family photos, as well as baby Olivia alone on the bed that I often set up in the studio. 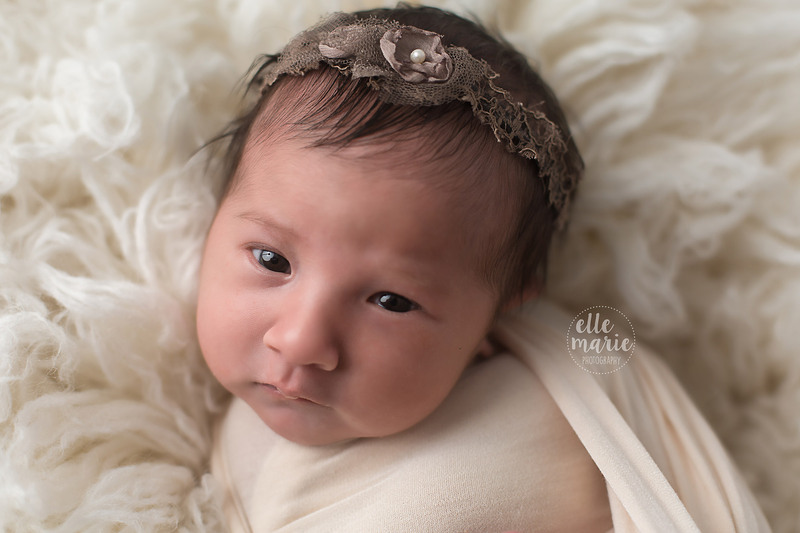 Olivia was just shy of 3 months old, and her expressions were just adorable! 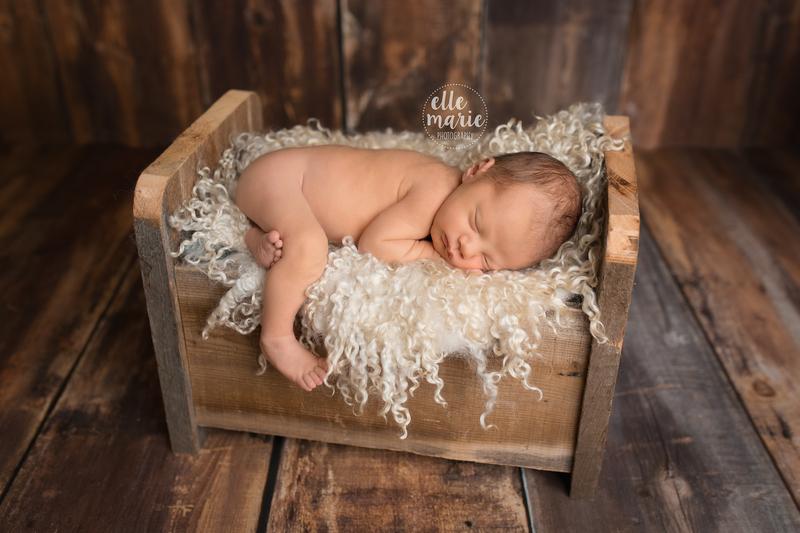 The results are beautiful, but with hair like Olivia’s, I knew these photos would be delightful! 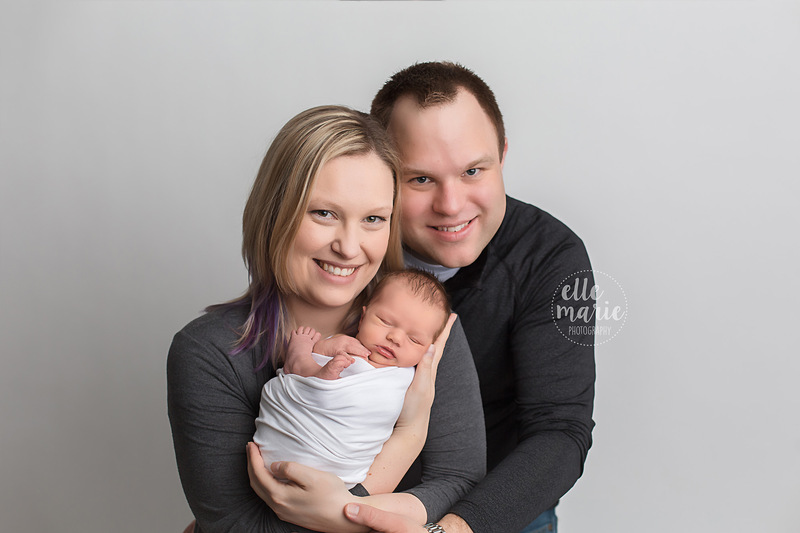 Big thank you to Robert and Barbara for bringing Olivia in and taking time out of their family vacation to have photos done!